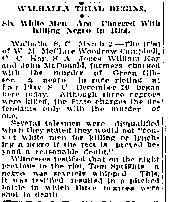 Details are somewhat sparing in these accounts, but the clippings refer to a race riot in Fairplay, SC, on or around December 20th, 1914. At least three African Americans were killed, and one badly beaten. Several white men were put on trial in connection with the riot, but it’s not clear how the trial turned out. This incident is not listed on the NAACP’s chart of anti-lynching prosecutions. This might mean they weren’t aware of it; or that the details in their chart differ from that in the news clippings below; or it might mean that the prosecutions were unsuccessful.